Welcome to The Handmade Mug Company, designed to provide individual and personalised handmade mugs suitable for all occasions. The Handmade Mug Company aims to solve those difficult gift problems, or provide the opportunity to treat yourself. Say it with ceramic letters this valentines! The Handmade Mug Company will be open Monday 24th December from 10am - 12 noon for order collection & last minute presents. 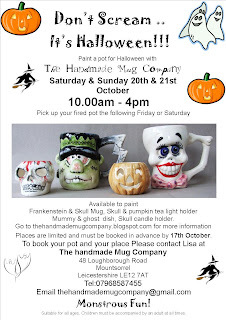 Halloween paint a pot workshop at The Handmade Mug Company is back! A Mummy or ghost dish a large skull candle holder and a pumpkin trinket box. I'm hoping that 2 people per session will have a throwing lesson enabling you to then take your throwing further if you wish. Children are very welcome at the afternoon class. Why not come along and make your Christmas presents!! 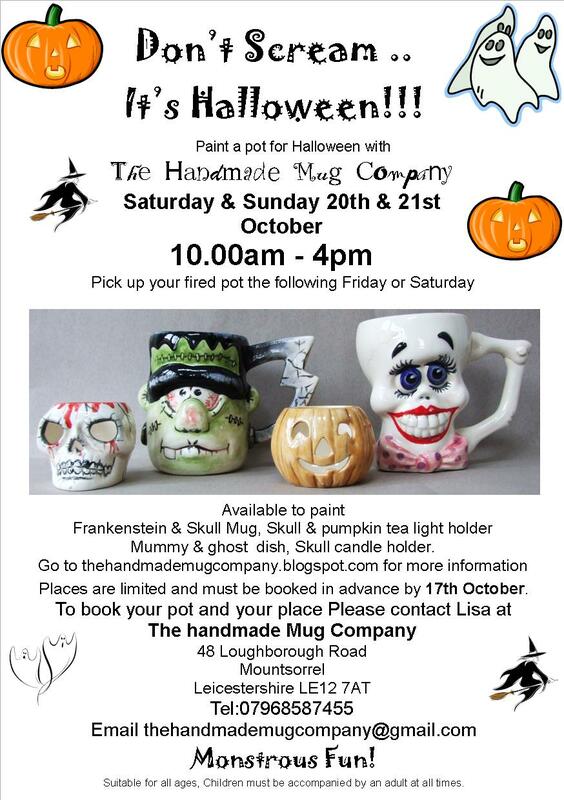 Contact Lisa on 07968587455 or email thehandmademugcompany@gmail.com for further details or to book your place. This lovely personalised ceramic heart makes a great napkin tie, place name &wedding favour all in one! 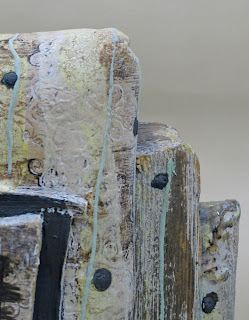 The writing is a mixture of upper & lower case with mixed fonts. With the addition of that special date. Available with a choice of pink, purple, aqua blue or green writing. £4.50 for 1 £30 for 10. Contact Lisa on 07968587455 for more details. Very sorry for any inconvenience. Mugs may vary slightly in size and shape as with the nature of handmade items but all will hold about half a pint.